Can you lean in just a little so I can hand you a bite? I so wish I could. This is to live for. As some epic things start out in our kitchen they are born from lack of fridge ingredients causing creativity to spin out of control. When they turn out good which is a pretty high percentage and probably just means I don’t take huge liberties with my ideas. This one though, joins the hug of comfort food with healthy food and Thai food. As I was thinking about it I decided I was tired of ‘pilaf’ type quinoa recipes and wanted to bake it but I’ve never done that but kept thinking until I came up with this plan of attack. If you forgive the scattering of ingredients and just let that lead you to use things you have in your fridge and cabinets, you will find a tasty dish awaits. 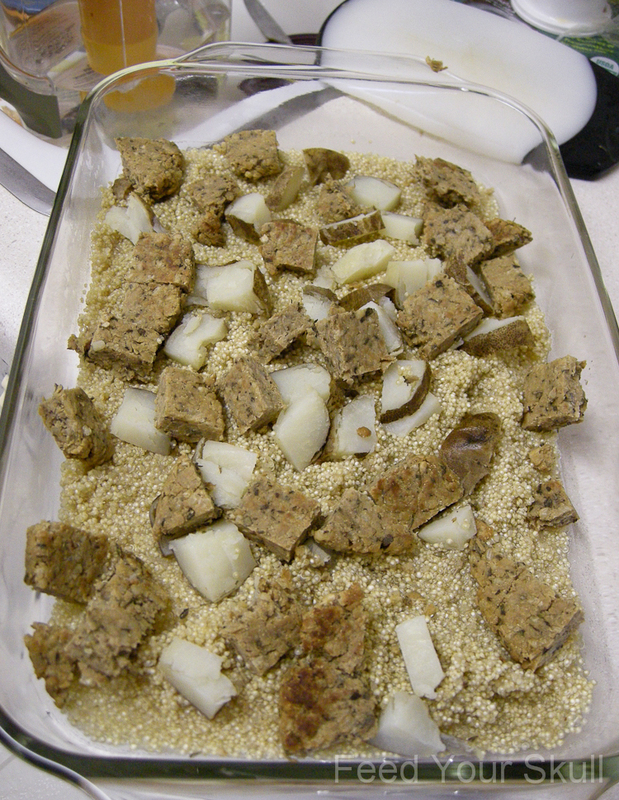 I think it is worth mentioning though that both the tempeh and potato probably help absorb some of the liquid. So, if you do replace ingredients, keep that in mind. 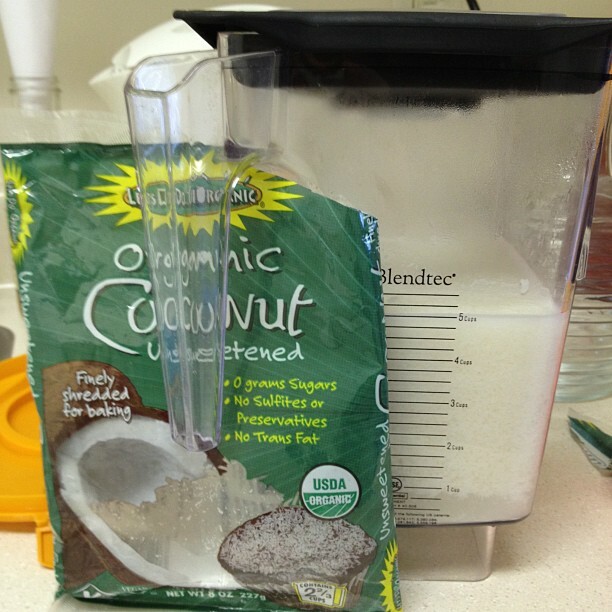 Start by placing 2 2/3 cups of dehydrated coconut flakes (I use Let’s Do Organic) in your Blendtec container with 3 3/4 cups of boiling water (used my electric tea kettle). Let sit for 40 minutes or longer. 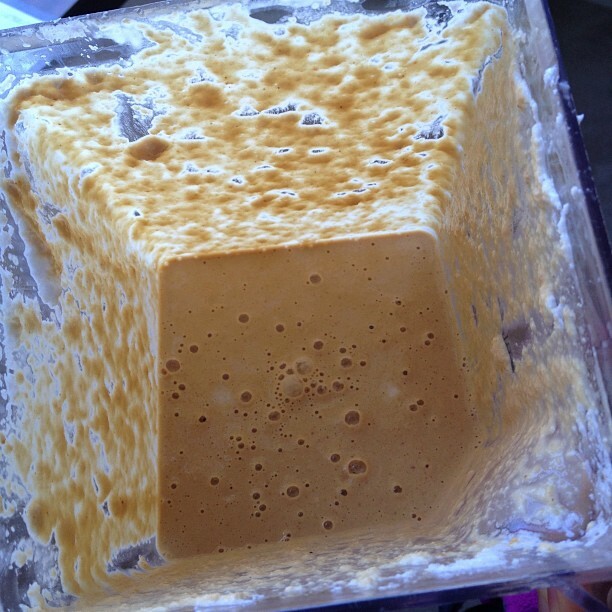 Then blend on your ‘whole juice’ setting or for about 1 minute. Now here is where I normally strain the pulp from the liquid to make coconut milk but I thought since this is a baked casserole any coconut shreds might soften and be quite tasty in this dish so I left the liquid with the pulp. This will make about 5 cups total but I poured out 3 cups leaving 2 in the blender, to which I added the following ingredients. Blend for about 50-60 seconds and set aside. You should have about 3 cups of peanut coconut cream. 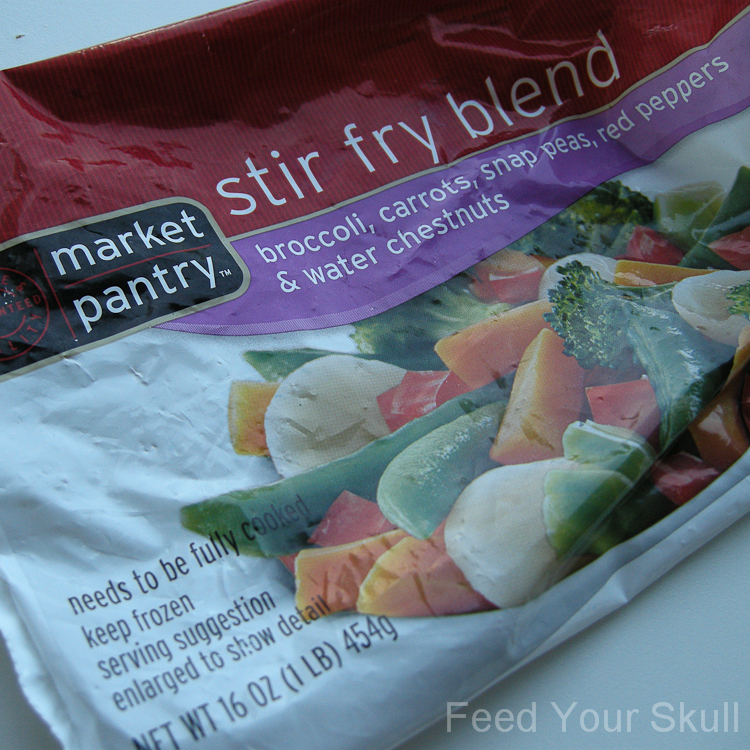 Place water in a medium sauce pan and bring to a boil, add quinoa and bring back to a boil. Boil for about 5 minutes and then remove from heat. Set aside. 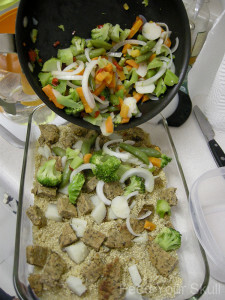 In a skillet add water, vegetables, and onion and bring to a boil, stirring the veg around for 2-3 minutes. Then remove from heat and using the lid or a colander, drain any remaining water. You only want them partially cooked, their internal bits should still be slightly frozen. 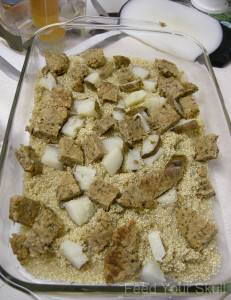 Add the quinoa to the pan and spread out evenly – it should still be watery and only partially cooked. 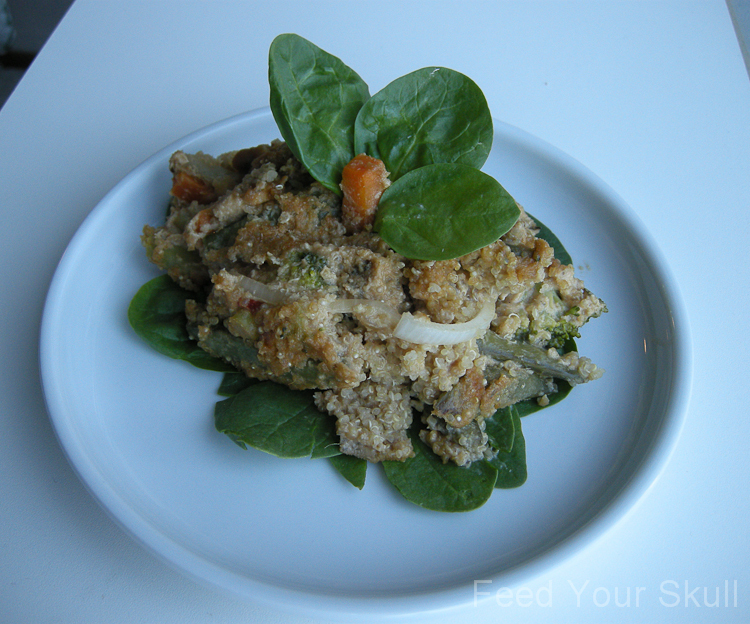 Evenly place the cubed potato and protein source on top of the quinoa and top with drained partially cooked veggies. Pour peanut coconut cream evenly across pan and using a spoon or spatula, stir it in a bit. 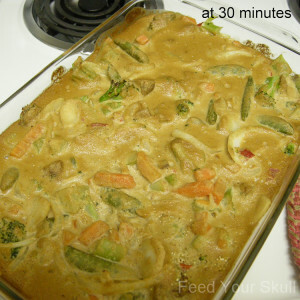 Place in the oven and bake 30-40 minutes. 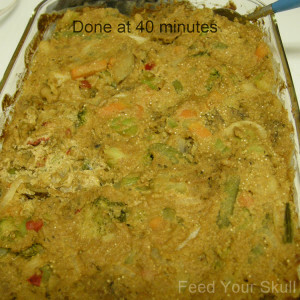 I pulled ours out at 30 minutes tasted it and stirred everything up and decided to bake another 10 minutes (for the quinoa’s sake), your call. 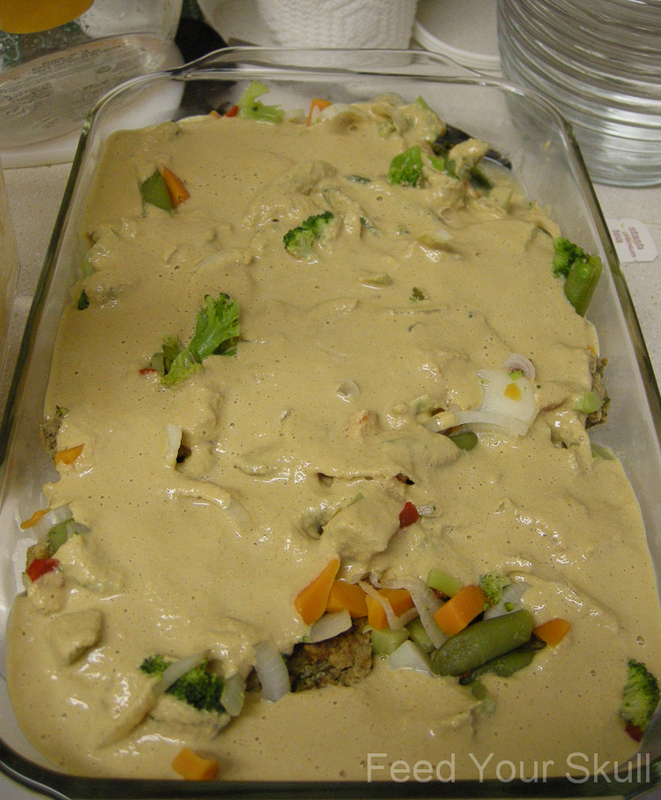 *Tip: After I made the peanut coconut cream sauce I preheated the oven and cooked the quinoa and vegetables at the same time. I love to juggle in the kitchen! 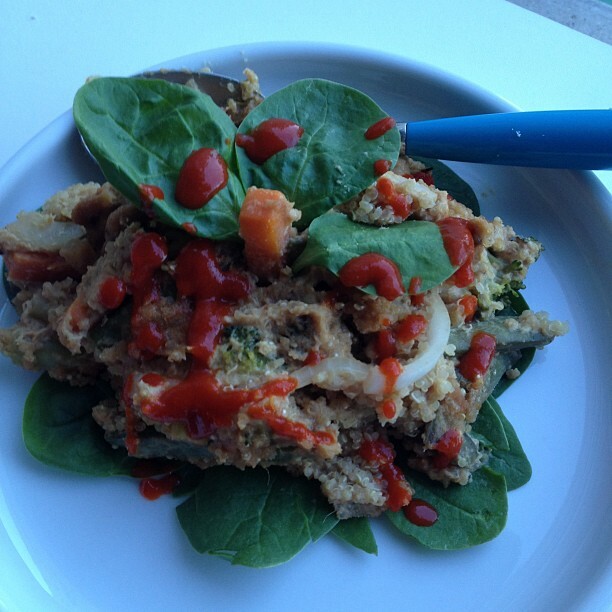 mmmm sriracha….even Jeremy likes it…he thinks it will be his gateway condiment into real spiciness! If you make this and I hope you do! 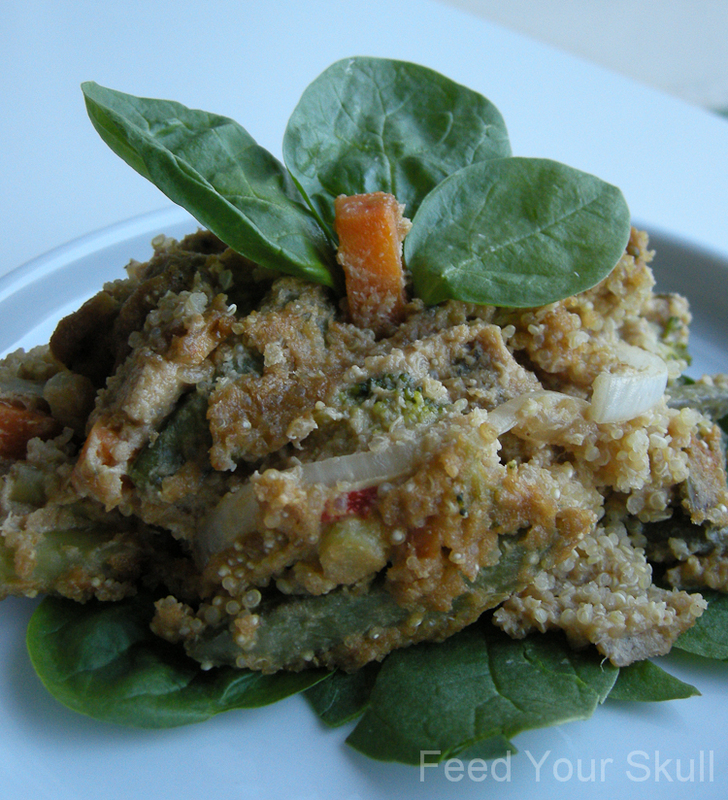 I invite you to come back and share any variations and if it rocked your quinoa boat.